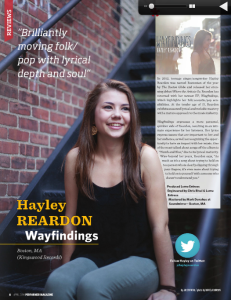 “Wayfindings” is remarkable in its mature approach, coming from an artist barely old enough to drive herself to gigs. 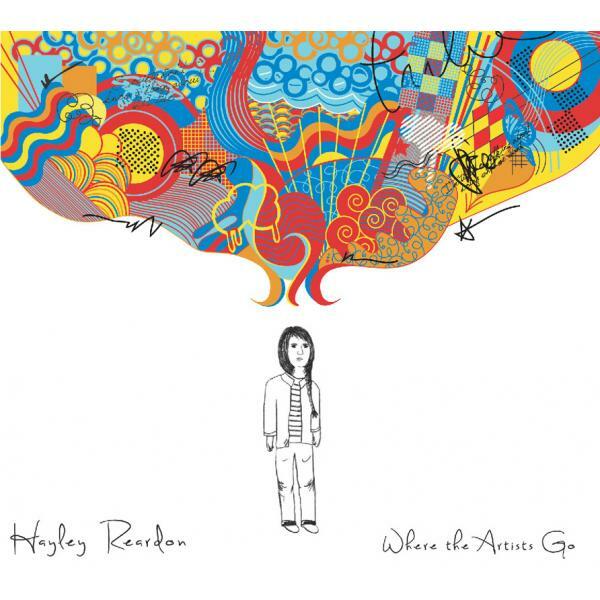 An emotional and creative leap forward from her 2012 debut “Where The Artists Go,” such highlights as “Numb and Blue”, a wryly sincere kiss-off to an ex with lines like “It’s the way you drive and all the Bob Dylan you pretend to like,” and an excellent cover of the Henry Thomas folk standard “Fishin’ Blues” have far more in common with Patty Griffin or Lucinda Williams than many of today’s young pop singer/songwriters, boasting a lyrical and melodic weight far beyond Reardon’s years. “When I made ‘Artists,’ I was fifteen and my goal was to record my ‘debut’ album. We sought out Lorne Entress to produce it and together we created something that I still feel perfectly marked who I was at that time. With “Wayfindings” though, there wasn’t as much planning. We really just set out to get down some newer songs and mark this explorative place between where I was with ‘Artists’ and where ever it is I’m going next. 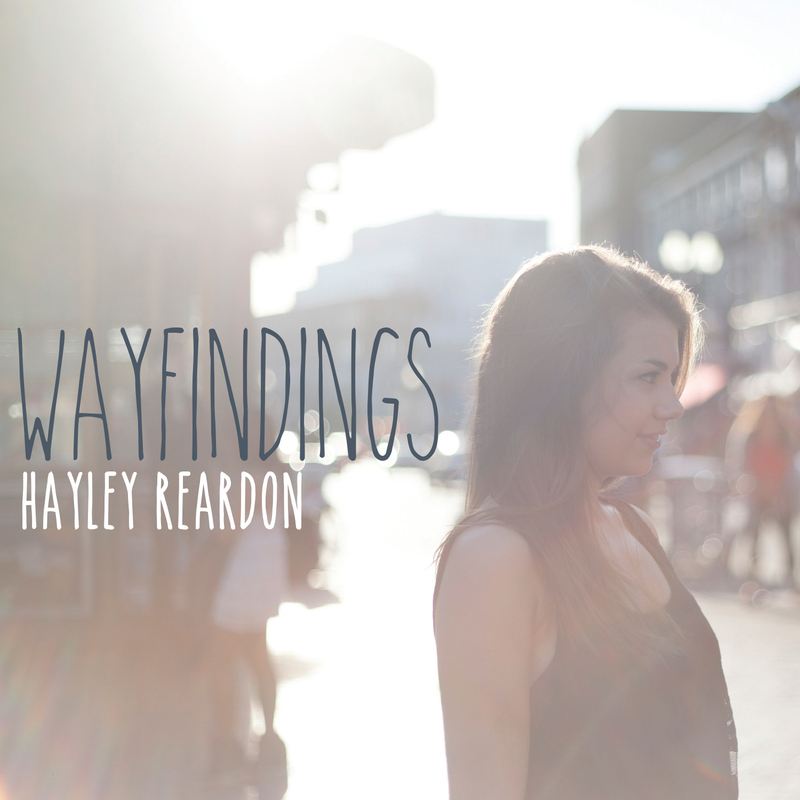 I’d call the songs on ‘Wayfindings’ quirkier, more personal, and a bit braver than the rest. I think the more that I grow and evolve, the more my songs do too. On the heels of winning the annual Boston Folk Festival Songwriting contest at only 12 years of age in 2009, Hayley released her first EP entitled “Beautiful Simplicity” which was followed by 2010’s “Hope You’re Smiling” that showcased the anthem “Stand Together,”a song penned to encourage students and young adults to find their own voice and take a stand against bullying. 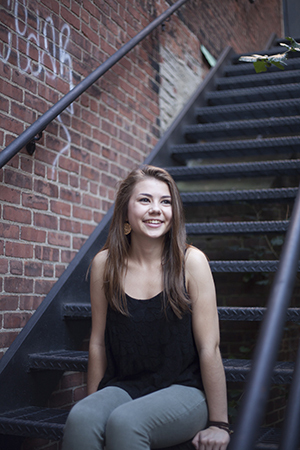 Taking a stand one step further, Hayley developed an in-school performance program called “Find Your Voice” to deliver peer targeted messaging encouraging empowerment through self-expression. Sharing her message in an official role as a National Peer Spokesperson, for PACER’s National Bullying Prevention Center (http://www.pacer.org/bullying), Ms. Reardon has enlightened packed middle school auditoriums throughout the country, from New England all the way to Alaska. These speaking engagements laid the foundation for honing her craft of delivering thoughtful musical performances. From opening shows for her idol Lori McKenna, to official showcases at the 2011/2012 Folk Alliance Conferences in Memphis, to appearances on DittyTV and WDVX’s Blue Plate Special in Knoxville, Hayley quickly developed a comforting, yet commanding, stage presence. Reardon’s appearance in the award-winning documentary “For The Love of the Music: The Club 47 Folk Revival,” (now available on DVD & Bluray) which won Best Documentary at the 2012 Boston International Film Fest has linked her to an extended lineage of matriarchs and patriarchs of the folk movement of the 1960s as Joan Baez, Tom Rush, Judy Collins, Taj Mahal, Maria Muldaur, Geoff Muldaur, Jim Kweskin, Jackie Washington, Jim Rooney, and Peter Rowan were all featured in the film. Her involvement with the documentary led to her relationship with Kingswood Records (the sister company to the film company Ezzie Films), and her debut LP “Where the Artists Go.” Deeply reflective of what it truly means to be an “artist,” regardless of the medium enveloped or passion embodied, this album was an apt introduction to the encompassing artistry that is Hayley Reardon. The eleven-song album was produced by renowned drummer Lorne Entress (Catie Curtis, Lori McKenna) with contributions from veteran sessions players Kevin Barry on guitars/lap steel (Ray LaMontagne, Mary Chapin Carpenter), Mark Erelli on guitar (Josh Ritter, Lori McKenna, Kelly Willis), Richard Gates on bass (Paula Cole, Dar Williams, Patty Larkin, The Weepies) and Glenn Patscha on piano/Hammond organ (Ryan Adams, Sheryl Crow, Willie Nelson). And now she stands together with history before her, proudly bearing the torch for a new generation of inspiration. From Boylston Street to Harvard Square to Cambridge to Strawberry Hill, the deep heartbeat of Massachusetts is only the precipice of where this artist will go. 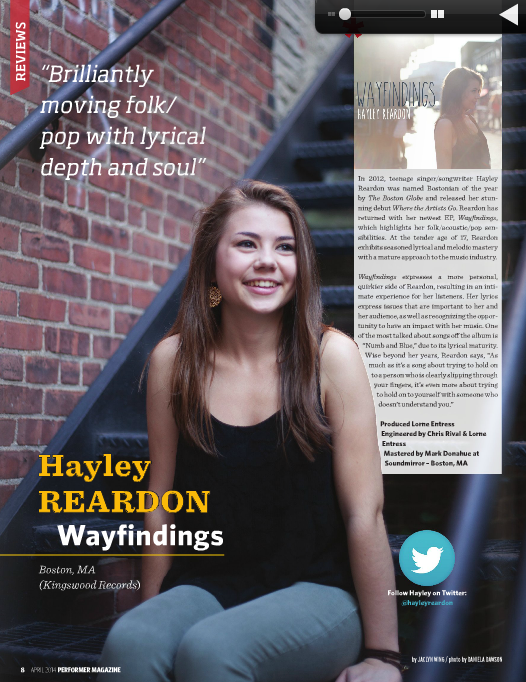 Get Wayfindings on CD and Digital, along with other Hayley Reardon music on ITunes and Amazon.